Good points, all to be ignored by the same people who think it fairy stories that we are going to have blackouts a few years hence. Do you think Governments have got worse at long-term planning at the 24hr news cycle has become de rigeur? What makes you think that the Russians would honour a long term gas contract at today's prices were they to, say, double in five years? Not sure I wholly agree, ND. I suggest he's right to bang on about Litvinenko as the Russians play hard ball. To like us, they need to respect us. What other bargaining counters do we have? Our influence elsewhere is sadly lacking these days. To make us forget, the Russians can give us gas to keep us on side. It should work with Libya in a reverse way after all. Miliband, who (unlike his colleagues) is talented, needs to make a point to get noticed in Europe. Great diplomacy. Go, Miliboy, Go. measured said: "Miliband, who (unlike his colleagues) is talented ..."
Not according to the people at the FCO who know him. It's pretty obvious that the lines about Livinenko and Lugovoi were pretty much rehearsed on both sides - and I very much doubt that they were any real part of the discussions, since if they were then Miliband would never have been invited in the first place and would have been snubbed big time straight away. Should also be remembered that UK is a major foreign investor in Russia (sometimes we are the amjor foreign investors) as well as the number one bolt hole for the oligarch and their families (including those who are still close to Putin) so we are not without cards that we can (and should) play in any commercial negotiations. The problem with Miliband is there is nothing he can say and nothing he could do that would move anyone to take him seriously. 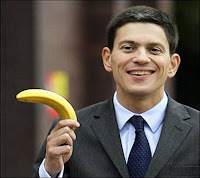 Brown has a Jonah touch, Miliband has an idiocy touch. do your manifold euro-contacts give you any insight as to why he seems to be well regarded, HG ? or is that, too, just NuLab spin ? "Then you can piss off and be Europe's 'Lord High Representative' or whatever. Perfect description of the offspring of a communist. I can't actually believe they are touting this been nowhere, done nothing, knows nothing but ideology cretin for EU Foreign Minister. Houdini: Because he is a talentless nobody whose strings can be more easily pulled by the powers that be behind the scenes. Yes the Russians are playing with no margins and their traditional retort is to bluster. We need a real negotiator in there, not Millipede. Miliband was not mentioned in Berlin, ND, at one of those think tank/politico/adviser groupings. Don't know about Brussels, where all the tips other than New Labour spin are supposed to be coming from. D'Alema, the former communist leader now social democrat PD (Partito Democratico), formerly Romano Prodi's foreign minister is well in the running. He fits the profile of the president being from the centre right, and the foreign minister from the centre left; experienced, urbane, not from one of the biggest countries, from the Mediterranean (to some extent) area grouping and from a still important - geo-politically and strategically - American ally. There has to be someone from the Med countries; and I wonder at the ignoring of their importance and input.